The Real News is at the Jewish Voices for Peace national membership meeting in Baltimore. And we wanted to speak with Joshua Ruebner about a latest op-ed published in Washington Post by Joshua Muravchik. It’s titled “War with Iran is probably our best option”. So, Josh, in the op-ed, essentially the argument is that Iran won’t accept any nuclear deal that won’t allow it to get a weapon, and that the only thing that the U.S. can do to stop this is to go to war. What’s your response to that argument? JOSHUA RUEBNER, AUTHOR, POLITICAL ANALYST, AND ACTIVIST: Well, this op-ed was written by one of the chicken hawks who brought us the war on Iraq and offered up some of these false promises, false allegations against Iraq to sell that deal and that war to the people of the United States. And here again we see an example of how analysts at think tanks are blatantly lying about Iran’s nuclear capabilities and intentions, saying that they’re on the path to developing nuclear weapons, when in fact both U.S. and Israeli intelligence agencies both confirm that Iran has not even engaged in any nuclear weapons research since 2003, much less any actual weaponization of their nuclear program. So we see this type of incessant fear mongering, incessant drive to war as part of this larger drive for an imperial U.S. foreign policy that has war as its first objective. And it’s part and parcel of this GOP attempt to undermine President Obama’s attempts to negotiate an accord with Iran peacefully. WORONCZUK: So, well, what do you make of the argument, though, that they’ll only accept a deal that allows them to make a weapon and that sanctions in the past have never been able to stop anyone from getting a nuclear bomb if they wanted one? RUEBNER: Well, we had plenty of sanctions against North Korea, and they went nuclear and dropped out of the Non-Proliferation Treaty. And it’s quite clear that the sanctions regime against Iran, which has really crippled their civilian economy, has created lots of incentives to actually bring Iran to the negotiating table. And U.S. and Iranian negotiators are quite close to concluding a political framework for an accord right now. So the notion that you can’t negotiate with Iran, the idea that you can’t get a deal right now, is sort of a last-ditch 11th-hour effort by these neocon chicken hawks who brought us the war with Iraq to try to undercut the president’s diplomacy, which is on the verge of success. WORONCZUK: Now, this seems to be of particular interest right now, as the Israeli elections are coming up in just a few days. 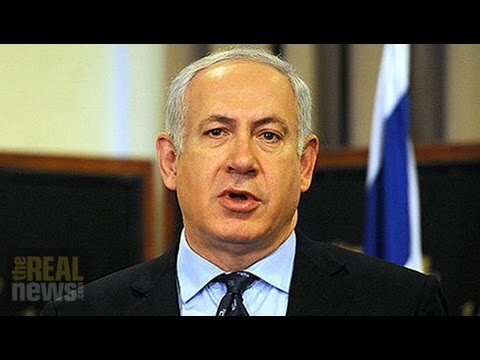 And some news that just came out recently was that Netanyahu tried to stop the Mossad from briefing some U.S. officials who–some senators who had come to Israel. And what the Mossad was going to tell them is that any attempt to pass a sanctions bill would be detrimental to the nuclear negotiation with Iran. What’s your response to that news? RUEBNER: Well, look, there’s a reason why when Netanyahu spoke to Congress a few weeks ago he told people not to rely on intelligence agencies’ briefings, and instead just to quote Google the nuclear capabilities of Iran. The reason why Netanyahu doesn’t want intelligence assessments out there is because, like I said, both U.S. and Israeli intelligence agencies agree that Iran is not pursuing a weaponization of its nuclear program right now. And so Netanyahu is trying to deflect attention away from the actual intelligence that exists in order to hawk for more war. WORONCZUK: And it seems that some of the debate over who should lead the Knesset next, whether Netanyahu or Herzog, some of it almost seems to be a debate about whether–who was really going to conform to the opinions or the analysis of the Israeli intelligence, and U.S. intelligence as well. RUEBNER: Well, I think that whoever leads the next Israeli government, whichever party forms the governing coalition, will still maintain this mantra that Iran’s nuclear program is an existential threat to Israel. I don’t think that’s going to change. That first became the mantra of a labor-led Israeli government back in the 1990s. And it’s a way, number one, of distracting from Israel’s brutality towards the Palestinian people, and number two, it’s also a convenient way to shield any scrutiny of Israel’s nuclear program and its actual nuclear weapons. Israel is the only nuclear weapons country in the entire Middle East. It’s the only country in the Middle East which refuses to sign the Non-Proliferation Treaty. So this is a way of shifting attention from its own illicit activities onto those activities of other countries, whether they’re elicit or not. WORONCZUK: Okay, Josh. Thanks for joining us. WORONCZUK: Thank you for joining us at The Real News Network.